For more 12 volt switching power supplies click here. For 12 volt battery backup power supplies click here. This genuine Dell 12 volt AC/DC switching power supply adapter is useful for any application requiring 12 volts at 12.5 amps or less. 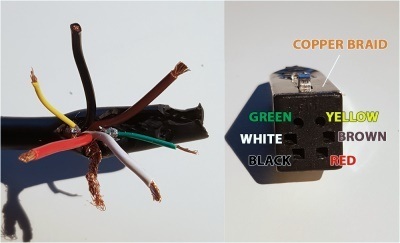 Input Connector IEC C13, Class I input socket allows cords for any country to be used, the North American cord is included. The 6 pins are identified as follows. You may need to short "remote" to negative to get the power supply to turn on. If you know what mating connector this uses it would be helpful if you would let us know so we can pass it on. Inexpensive switchmode 150 watt AC switching power supply 12VDC AC/ DC converter.